Campaign posters in Lagos on Feb. 5. Aliyu’s lack of support is typical for women running for office in Nigeria, which holds presidential and parliamentary elections on Feb. 16. 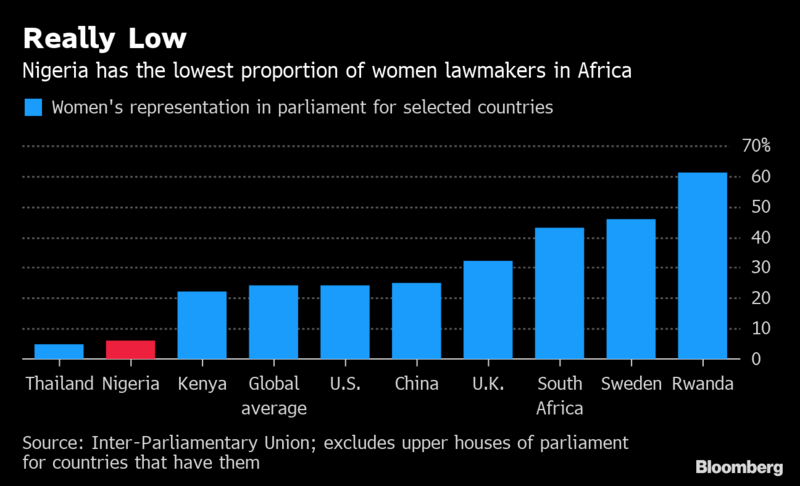 Africa’s most populous democracy has the lowest proportion of female lawmakers on the continent, according to the Inter-Parliamentary Union, an advocacy group that tallies representation. Just 6 percent of seats in the national parliament are held by women, compared to 23 percent in the U.S., ranking it number 181 out of 188 countries for which the Geneva-based group has data. Muhammadu Buhari and Angela Merkel in 2016. Nigeria has never had a female president or vice president, and no governor of its 36 states has ever been a woman. The most high-profile female politician to date is Ngozi Okonjo-Iweala, who served as coordinating minister for the economy between 2011 and 2015, a role that was often compared to that of a prime minister. Of the 70-odd presidential candidates in this year’s election, six were women. The best-known of those, former World Bank Vice President Oby Ezekwesili, quit the race last month after falling out with her party. But politics remain a male-dominated field in a country where polygamy is widespread and wives are often expected to look after children and the household. It’s a common view among voters such as David Bassey, a 34-year-old security guard in the commercial capital, Lagos. Christina Ude campaigns in Oru East local government in Imo Sate. Another hurdle is a lack of funding, according to Christina Ude, 42, a former accountant and teacher who’s running for a seat in the House of Representatives. Political parties can charge candidates asking to run on their platform tens of thousands of dollars for nomination forms alone and expenses often include paying people to come to rallies. Ude is still optimistic that even without a quota, Nigerians will eventually vote for female lawmakers because while men have been in charge little has changed. But it will be an uphill battle.